This is a picture from a recent service call I did. 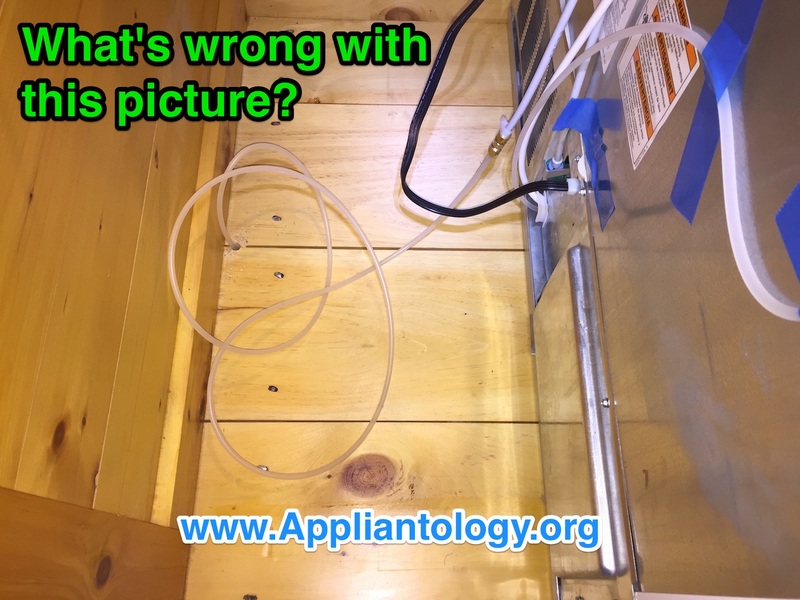 That white/translucent plastic tubing you see coming out of the floor and connecting to the gray PEX tubing on the refrigerator is a big No-No. That's a flood waiting to happen. Think about it: that plastic tubing us under household water pressure 24/7-- that's 40 to 60 psi. Combine that with with the fact that it gets hot behind a refrigerator that's pushed back against the wall, especially in summer. Heat... plastic... brittle... cracked or burst plastic tubing. And what's to stop the water from spraying out at household pressure when (not if) that plastic tubing breaks? Ain't but one thing: your hand on the shut off valve to stop the water flow. What if you can't find the shut off valve to stop the water flow because the plumber installed it in a weird location or the house has been renovated since the water line was installed and the valve is inaccessible? What if you can't reach the shut off valve because it's up behind a drop ceiling and you can't find the ladder during the panic to stop the water? What happens if you're not home when that cheap plastic tubing bursts, as it inevitably will given enough heat and time? You get the idea. So how do you avoid all this unpleasantness? Any water supply line or tubing in your house that's under continuous household pressure should only be one of three things: copper, steel-braided flex line, or PEX. Now, if the plastic water tubing were AFTER the refrigerator's water inlet valve, as is commonly the case with older refrigerators, not such a big deal because 1) the tubing is not under continuous pressure; it’s only under pressure when the solenoid valve opens which 2) only occurs for several seconds every couple of hours or so for the ice maker or on-demand for the water dispenser. Moral of the story: plastic and household plumbing don't mix. Next entry What's wrong with this dryer outlet? Good info, but looking at the line from the connection leading to and out of the water filter, the water goes to the filter then to the valve. That means the filter and lines are under pressure. aren't those lines plastic or are they pex? Great observation, mah bruvah! I was hoping someone would notice that and ax about it. I knew it would have to be someone with a keen eye for detail. The gray tubing that you see connecting to the top side of that brass union is the refrigerator's own native tubing which, on most of the newer refrigerators, is PEX. The manufacturers are all transitioning to this for exactly the reasons why plastic tubing should not be used in household plumbing: flood prevention and the resulting liability. The filter and filter head are always under household pressure but they are much more able to withstand that than the plastic tubing that you see coming up from the floor to the brass union. What about the excessive length of the white plastic tubing also? Yes, we understand the need for back-of-frig access, but that looks like a good 4 to 6 feet ?!? That invites kinks in the line when frig is slid up against the wall, thus creating another weak point for the great flood, low-no ice production over time, and H2O dispenser issues. I wouldn't go back but change procedure going forward... but if either one bursts, flood the house damaging rare and expensive hardwood floors.. then forget all I said. lol. The more I think about it, it is probably a good idea to have customers sign a waiver of liability form for water lines not provided by customer. Thanks for the response and I will install different water lines from here on in.